Betta tail type genetics are mysterious in some ways. The laws of genetics specifically state that when crossed, two genes do not mix, but average out and the most dominant shows. This is not true for bettas. Veiltail bettas have the ribbonlike tails and are quite common in stores. They are shunned by show breeders or just breeders in general, since they are so common. Any tail mixed with veiltail will automatically become 100% veiltail fry, no matter what. It is the most dominant gene in betta fish, and can be represented on a Punett Square as VV. Crowntail bettas have stringy almost ripped up looking tails and are also quite common. They are favored by lots of people on behalf of their uniqueness and showiness. First time breeders may try using this gene first in their lines. Since it is a recessive gene, you must be careful with what you choose to cross him/her with. It can be shown on a Punnet Square as cc. Halfmoon bettas have full tails that from top to bottom average at about a 180 degree angle and are one of the least common types found in stores. They are preferred for show and breeding since they are so beautiful and elegant in appearence. This tail has the most recessive genes in all bettas (common bettas), and can be shown on a Punnet Square as hh. Deltatail bettas are quite similar to the halfmoon, but with tails that go below the 180 degree angle. 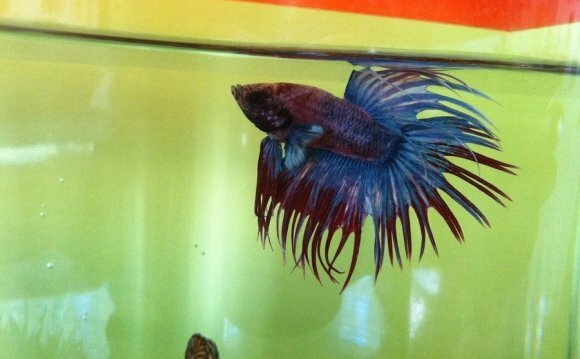 These are one of the not-so-common betta tail types in the stores. They may be selected for a show fish or a breeding fish. This is a heterozygous (multi-gene) fish, so it can be shown on a Punnett Square as Dd. Half sun/combtail bettas can only be achieved by incomplete dominance, which causes both parent genes to show in the fish. They are originated from a halfmoon and a crowntail crossing and are favored by many show breeders or normal breeders in general. They share the 180 degree spread of the halfmoon tail, but yet all the while have short crowntail rays, making it seem as if it were a comb or sun. This is a recessive gene(s) and is shown on the Punnett Square as either ch (female crowntail, male halfmoon= combtail) or hc (female halfmoon, male crowntail= half sun). Spadetail bettas are one of THE rarest tail types to find anywhere. The genes are specifically recessive, yet not as recessive as that of the halfmoon, but was quickly covered over the years by other genes. They are the most prized possessions of show breeders and breeders in general. They can be shown on the punnett square as ss. Each box shows you 25% (1 quarter) of the fry you will have. In the example, my male genes were VV, or veiltail, and my female genes were hh, or halfmoon. Since the V’s are capital, that makes them dominant. Since all four quarters of the square have the genetics Vh, the fry will be heterozygous (multi-gened) for the veiltail trait. All (100%) of my fry would be veiltails. If, let’s say, you had a deltatail and a halfmoon. If you crossed them you’d get the genetics, Dh, Dh, dh, and dh. Dh is heterozygous deltatail, and dh may look heterozygous, but it is also considered to be homozygous for the over-deltatail trait. Not a good enough explanation or need to know different genetics than those listed above? PM me for extra advice. How to care for a baby Betta?